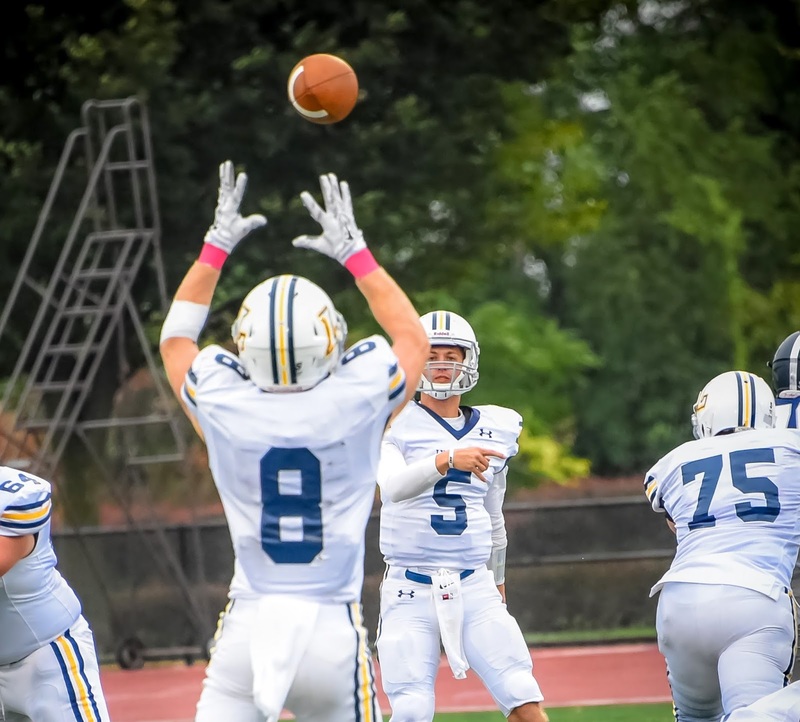 CHESTER, Pa. – Widener comes up big forcing fumbles, interceptions, special teams breakdowns and stifling defense to defeat Lycoming in a 48-7 rout. Widener University limited Lycoming to only 126 yards of total offense. This was the most point scored by a Widener team since their 2000 50-49 win over Lycoming in overtime. Lycoming's Senior Ryan Umpleby (Forest Hill, Md./Fallston) was one bright spot for the Warriors. He had189 all-purpose yards to become the third player in the Lycoming College football team’s history to post 1,000 in three straight seasons. The Warriors (2-6 overall, 2-5 MAC) did pick off a season-high three passes, but Widener used 272 rushing yards to make up for it. Sophomore Mike Ward (Edgewater, Md./South River) led the effort with seven tackles and an interception, while freshmen Jarrelle Payne (Jersey City, N.J./Liberty) and Khamari Williams (Gaithersburg, Md./The Avalon School) each also added picks. Umpleby, who needed four yards in the game to join Craig Needhammer (2012-14) and Brian Thompson (1996-98) in the 1,000-yard club, posted 189, thanks to 142 on seven kickoff returns, 10 yards on a punt return, 16 yards rushing and 21 receiving. He is second on the team in all-purpose yards with 1,185, just four behind junior Blake Bowman (Valley View, Pa./Tri-Valley), who ran for 74 yards on 17 carries. Down 10-0, the Warriors got on the board early in the second quarter thanks to a 10-play, 75-yard drive, with Bowman running five times on the drive and a personal foul penalty also aiding the Warriors before junior Chase Whiteman (Gettysburg, Pa./Gettysburg) found Umpleby for a 3-yard score. Widener responded on the next drive, getting three points back with a seven-play, 61-yard drive before Ryan O’Hara hit a 30-yard field goal. Widener added another score midway through the second quarter, with Robert Getz scoring on an 18-yard rush to cap a 35-yard drive to make it 20-7. Late in the first half, the Pride took advantage of a 61-yard punt return by Jake Parola before Alex Krivda found Philip Ragona for an eight-yard touchdown on the first play of the drive to help the Pride take a 27-7 lead into the break. The Pride added three more scores in the second half, with Krivda finding Ragona for a nine-yard touchdown with 10:37 left in the third before Krivda scored on a nine-yard run with 19 seconds left in the quarter. Krivda added one more score with a 29-yard touchdown pass to Max Kutler with 13:34 left in the fourth. The Pride got started with their first drive of the game, driving 51 yards in 10 plays, ending it with a 32-yard field goal by Ryan O’Hara after the Warriors forced Widener into a 4-and-11 at the 15-yard line. After an interception ended Lycoming’s first drive, Payne returned the favor with an interception at the Lycoming 1-yard line. However, the Pride returned the favor on the next play and 33-yards later, Alex Krivda found Blaine Price for a 15-yard touchdown to give the Pride a 10-0 lead with 2:50 left in the first half. Whiteman finished 7-of-14 for 48 yards and a touchdown. He was intercepted twice. The Warriors used three quarterbacks in the game, as sophomore Chase Williams (Damascus, Md./Damascus) went 3-of-5 for 22 yards in his first action and sophomore Collin Wright (Secane, Pa./Ridley) went 1-of-3. SophomoreSam Dressler (Riverside, Pa./Danville Area) ran six times for 20 yards. Getz ran the ball 16 times for 123 yards and a touchdown and Malik Murray had a 71-yard carry in the third quarter. Krivda finished 25-of-40 for 183 yards, two interceptions and four touchdowns. Price caught five passes for 54 yards and a touchdown and Kutler caught five passes for 52 yards and a score. Sophomore Caleb Robbins (Williamsport, Pa./Loyalsock Township) added six stops and a breakup and junior Jon Rummell (Lykens, Pa./Williams Valley), senior John Ciurlino (Springfield, Pa./Springfield), seniorMatt Malecki (Stevensville, Md./Kent Island) and senior Cole Welham (Lewistown, Pa./Lewistown Area) all had four solo tackles and a tackle for loss. Welham also had a sack. Stacey Sunnerville led the Pride with eight tackles and three sacks and Brandon Jones added five stops and 3.5 sacks. The Warriors get back on the field on Saturday, Nov. 7, when they host Delaware Valley University in a MAC clash at 1 p.m. at David Person Field.